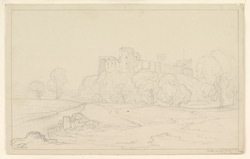 Drawing of the curtain wall and towers of Cockermouth Castle in Cumbria, Northern England. This view shows in particular the natural protection provided by its position on a rocky plateau above the confluence of the Rivers Cocker and Derwent. It is also surrounded by a wide moat and a large ditch. Cockermouth is situated on the northern edge of the Lake District and is the birthplace of William Wordsworth. It is thought that the original castle was built here by the Normans in the 12th century, possibly ordered by William de Fortibus. During the 13th and 14th centuries many alterations were made to the castle and a large wing was added.